Happy Hamby Campers: Picnic pride! Nick and I went out to our favourite tip shop today, just to poke around. While we were there I spotted this 12-volt warmer/cooler. We didn't care if it worked. 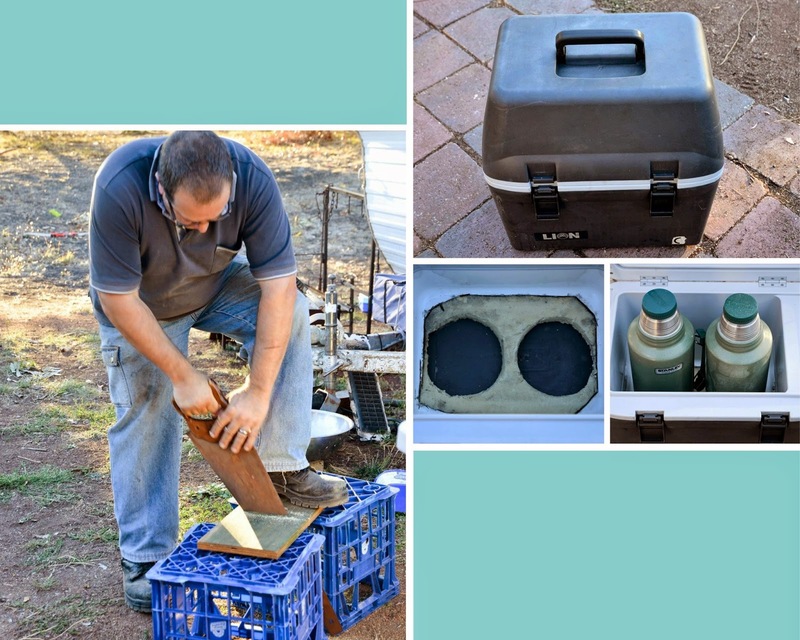 We weren't going to use it for it's original purpose but rather convert it into a (well insulated) thermos carrier. There were tall thermoses in a box at the tip shop and we tried one of them in the cooler. It fit, so we paid $5.00 and brought our bounty home! It soon became clear that our 1.9-litre Stanley thermoses are taller than the few for sale at the tip shop. Drat! Some modifications were obviously necessary. On inspection, the best option was to remove a piece of bottom lining - and cut recesses into the insulating foam. I thought the lining was plastic but it was actually rather thick aluminium and removing it was a bit more involved than first anticipated. Nick persevered though and the thermoses now fit easily (with or without lids). As we weren't going to use the unit as a heater/cooler, Nick took out many of the unnecessary parts. He also cut a piece of board to fit the bottom of the case. It will cover the bare insulation and rough aluminium edges. We might add some extra foam pieces (mounted to the longer sides) for additional insulation - and to ensure both thermoses are well protected. I bought my Stanley thermoses during a BigW sale about 10 years ago. They were at least half price, so I bought two of the Classic 1.9 litre style (which keep drinks hot 24 hours or cold 32 hours). I was so chuffed with the massive discount that I went back a few days later to buy two of the smaller food flasks. When Nick first suggested an insulated cover for one of the taller thermoses, I was doubtful. However it quite markedly further increased the heat retention properties of the thermos - and we used the same blue cover till quite recently. Since it's demise, I've looked for something that might house both thermoses. They do sit in a larger wine cooler bag but if we only take one thermos, the bag often topples over in transit. (The smaller food flasks sit in a soft-sided cooler bag that has recently been revamped)! 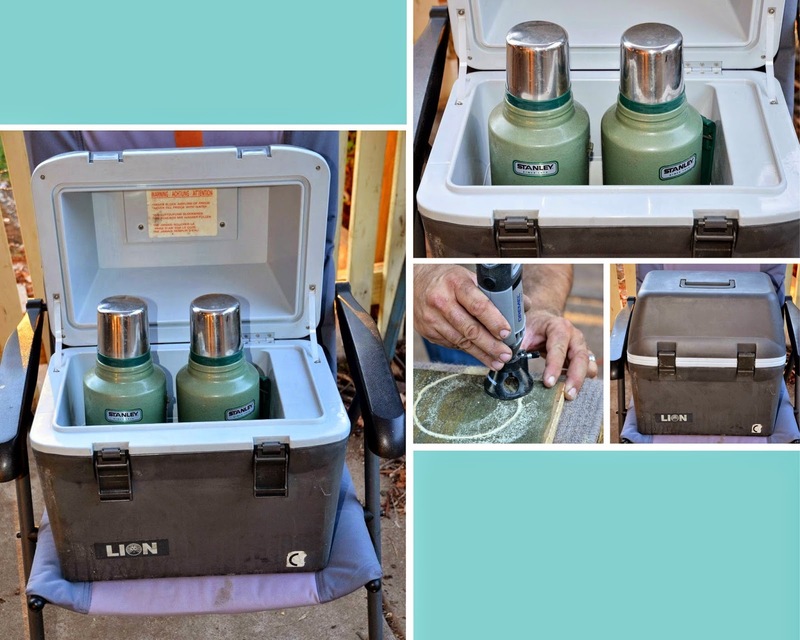 I bought a tall esky the other day (on sale at the Reject Shop for $7.00) but it wasn't tall enough - and in any case only one thermos would fit, so I returned the unit the same afternoon. Against that background, we are very chuffed with our $5.00 tip shop find!